Starr Convictions: Awesome Board Games for the Bored! Have you ever played Settlers of Catan or Fluxx? If not, you're missing out on two really awesome games that you wouldn't normally group with traditional board games, but they are just as fun! In Settlers of Catan, game players build a board of resources tiles and then try to build roads, settlements and cities to earn victory points. Every time the dice are rolled, someone collects the all important resources of wheat, wood, brick, sheep, or ore, and if you've placed your settlements right, you can cash in on more than one! You can also trade resources with other players, conduct maritime trade and rob each other on certain dice rolls (which also prevents people from gaining valuable resources)! So far, I've only played the regular one, but it's a lot of fun, and I think Seafarers is next on my list to try! ** 1/7/13 UPDATE: Since my original post, I tried out the Seafarers of Catan expansion. With potential for a bigger map, the ability to build ships and roads, and a pirate ship to go with the robber, it was a lot of fun and added more stakes to the base version. I would definitely recommend trying this one out! Creeper cards that might keep you from winning! Basic game play goes like this: On your turn, draw the correct amount of cards as stated by the current rules on the table, then play the amount the rules say, all while following the rules on the cards you play. You can play new rules, actions, keepers and goal cards. Keepers go on the table in front of you, and goals are what you need to meet to win. See the first picture above? The goal is MILK AND COOKIES, so if you have those two keepers in front of you or can play one on your turn, you win! Just be careful of having a creeper, because if you do, and it's not part of the goal, you can't win until you get rid of it! 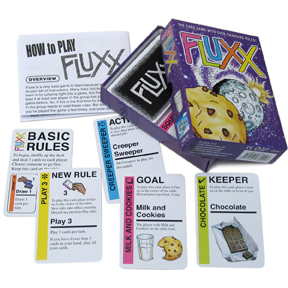 Fluxx has many other themed versions as well with more rules and cool things to do! I've played the first one in this picture, as well as Martian Fluxx, both of which are great. With so many choices, there's a Fluxx for everyone! Also, be sure to check out Wil Wheaton's (Star Trek: The Next Generation, Eureka, Big Bang Theory) YouTube web show Table Top, where he teaches viewers how to play these games and many more! ** 1/7/13 UPDATE: I recently tried out Star Fluxx, and I think it's my favorite theme so far. It makes great SciFi references without explicitly mentioning classics, and there are additional rules and surprises that add so many chances to win by so many methods! I would suggest playing the 4.0 version first, but after that, this one's a blast!